(Toronto, March 23, 2017) CMHA congratulates the Federal Government for demonstrating a strong commitment to mental health in Canada in its 2017 Budget. The Government’s significant investment in mental heath is a great start toward correcting the historical, woeful underfunding of mental health in this country. However, there is some way to go before mental health care is funded on par with physical health care, and in proportion to the burden of illness. The Canadian Mental Health Association calls for continued investment in mental health – especially in community-based services and support – to bring Canada in line with other G8 countries, where it still lags behind. 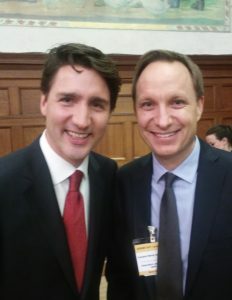 CMHA National Director of Program Innovation, Greg Kyllo, poses with Prime Minister, Justin Trudeau at 2017 Budget. Through its comprehensive “whole of government” approach, the Federal Government is demonstrating its broad understanding of mental health, through additional funding, for example, for housing and justice. It is especially encouraging to see that this government will prioritize housing support for vulnerable citizens, including: seniors, Indigenous Peoples, survivors fleeing domestic violence, persons with disabilities, those dealing with mental health issues, and veterans. CMHA also applauds this government’s targeted funding for high need communities, such as veterans, active duty military, and military families, as well as Indigenous Peoples, caregivers, children and youth, and individuals living with substance-related disorders. When it comes to our Indigenous communities, we are thrilled by this Government’s proposal to support the services of traditional healers to address mental health needs. The Canadian Mental Health Association stands for mental health for all, and believes that it is only in mentally healthy societies that people can thrive. Creating a truly healthy society requires sustained investment in mental health care as well as mental health promotion and illness prevention by both the government and private sectors. Everyone in Canada has a role to play to transform our response to mental health for all Canadians.